Two new operating system versions are scheduled for release soon: Ubuntu 12.04 and Windows 8. Since beta, trial versions of both operating systems are freely available for download, I thought it would be interesting to give both a try and see how they compare to each other. Ubuntu 12.04 beta1 (32-bit), Ubuntu 12.04 beta1 (64-bit), and Windows 8 Consumer Preview (32-bit). While this is primarily a 32-bit comparison, I included Ubuntu 12.04 64-bit just to see how its 64-bit requirements would compare with the 32-bit versions. Since these are beta versions, it would be useless to install them on production systems. After all, I intend to delete them as soon as possible. So, to be fair to both operating systems, each is installed in its own virtual machine using identical virtual settings in VirtualBox 4.1.8 running on an Ubuntu 10.10 64-bit host. Surprisingly, VirtualBox 4.1.8 already knows about Windows 8, so it automatically fills in default settings for Windows 8. I was surprised to see that Windows 8 wants 1G of memory and 20G of virtual hard drive space whereas Windows XP and Windows 7 need less. This feels like Vista all over again. On the other hand, Ubuntu 12.04 beta1 required fewer virtual resources: Only 512M of memory and 8G of virtual hard drive space. Just like previous versions. Linux has a reputation of being less demanding with its hardware requirements, and it still shows. This is always welcome in my book since I dislike the necessity and expense of buying new hardware to run the latest, greatest OS. I left all settings to their defaults but enabled 3D acceleration where possible. Both operating systems were installed one at a time without anything extra running on the host in order to time the installation process with a good, old-fashioned stopwatch starting from the point where installation took over after user entry was complete. For Ubuntu 12.04, timing began after clicking the “Install Now” button on the Install dialog because user entry is performed while Ubuntu installs. For Windows 8, timing began at the step 2 “Installing Windows” phase. For both, timing ended when the login screen first appeared. In Windows 8, I paused the timing for the user entry steps found on the Personalization page. Which installed in less time? All were about the same, but Ubuntu 12.04 (32-bit) took the lead at 7 minutes 1 second, followed by Ubuntu 12.04 (64-bit) at 7 minutes and 22 seconds while Windows 8 took 8 minutes and 33 seconds. Not really a big difference. With all operating systems fully installed, up, and running, the first thing I like to do is find out how much memory and hard drive space a fresh installation consumes. With this out of the way, I next wanted to find out how easy both operating systems were to figure out without consulting help or reading any manuals. Let’s begin. Immediately, I thought, “This is a nice-looking login screen. Easy to understand and attractive in its design.” After logging in, the familiar Unity desktop appeared. It looks like the previous version 11. Windows and menus were as snappy and responsive as always while consuming fewer system resources than Windows 8. The 64-bit and 32-bit versions look identical and function the same, so I treated them as one for this test. I noticed that the 32-bit version required less memory than the 64-bit version. Of course, this was measured immediately upon login with no extra running programs or processes. Linux kernel 3.2.0-17-generic and Firefox 11 are the new default versions. On the surface, there is not much to add to Ubuntu. 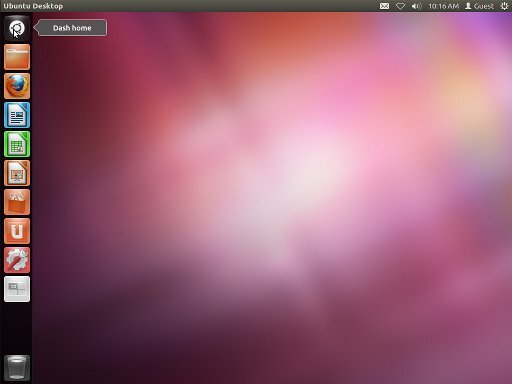 If you are already familiar with Ubuntu 11 and know your way around the Unity GUI, then you will feel right at home with Ubuntu 12.04. You can immediately pick up and go with what you know, unlike Windows 8. However, if you dislike Unity and Ubuntu 11, then you might experience the same dislikes with Ubuntu 12.04 as I did. Unity is the kind of system you will either like or dislike, and each user has his own opinion. Though, I have to admit, I always liked how the icons “jiggle” in the sidebar to grab my attention. Nice touch! On the plus side, I did not have to fumble through the interface to shut down the computer like I did with Windows 8. The power icon is located in the upper right-hand corner where I expected to find it in Ubuntu, so I clicked it, chose the Shutdown option, and Ubuntu shut itself down. Simple. A. Not really, but the newer kernel and LTS (long-term support) make it worth considering. Since Windows 8 is where I spent most of my time, I have more to say about it. Short answer: Windows 8 was a surprise, but not in a good way. I believe an operating system should be so well laid out and intuitive, that a newbie can figure out the essentials without having to read the manual. That’s just good design, and that was the approach I took to testing both Ubuntu 12.04 and Windows 8. Operating systems that are logical and easy to grasp upon first glance win points in my book, which is why I switched to Ubuntu years ago. Upon logging in to Windows 8, you will be see a colorful, tiled "Puzzle Page"
Instead of a desktop, I was presented with colorful tiles of varying sizes that, after a few moments of head-scratching, must represent shortcuts to applications. One was labeled “Desktop,” so I clicked that, and, Lo and Behold!, the desktop appeared! The Windows 8 Desktop. Notice that there is no Start menu in the taskbar. The desktop looks like that of Windows 7. 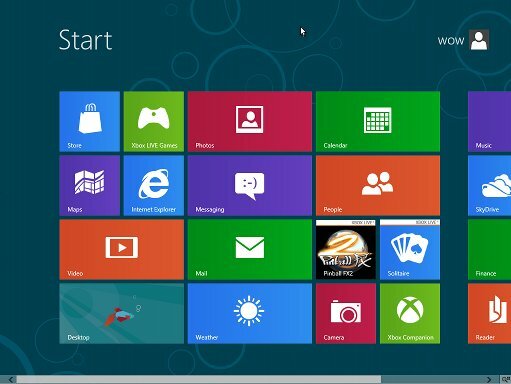 Immediately, I was impressed that the Windows 8 Aero effects worked in VirtualBox 4.1.8. This means that the title bars have a fuzzy, see-through, blur effect. They appear solid blue in Vista and Windows 7 running in VirtualBox 4.1.8, so this was a pleasant surprise. The VirtualBox Guest Additions do not install fully in Windows 8, but this was not a problem. 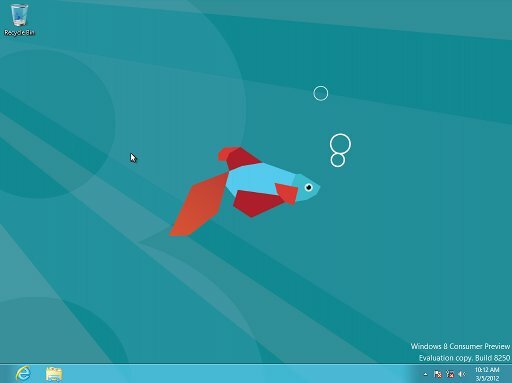 I also liked the default light blue theme of Windows 8. It felt clean and refreshing compared to Ubuntu’s dark purple default theme. There was no Start menu! No good. The missing Start menu is an intentional design feature in order to use the “puzzle page” (my name for the colorful tiles that appear after logging in). 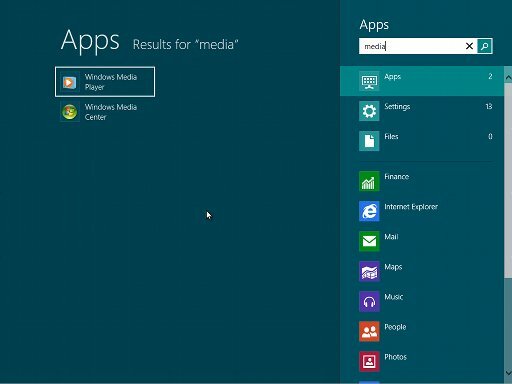 There is no way (I could find) to bring the Start menu back, and posted registry tricks did not work…at least for me. After some trial and error, I found out! From the desktop, first, press the Windows key on the keyboard. The puzzle page appears. Next, start typing the name of the program you want to open. Another page appears listing programs with matching names. This is how you open programs in Windows 8. It's time to play "Guess That Program!" in a big, full-screen way. What a minute. Haven't I seen this before? When the program appears after you have typed enough characters, click its icon, and the program will open in the desktop. Not very convenient, in my opinion. Windows 8 does the same thing as Unity and has similar issues, at least it does for me. True, you can browse through programs by categories, but it could be better. Now, how hard can this be? Believe it or not, I fiddled for minutes searching for the shutdown option. Since the Start menu is gone, there is no apparent shutdown menu. So, how do you shutdown? After much trial and error, I found a way by pressing the Windows key on the keyboard, clicking the user icon on the puzzle page, clicking “Sign Out” from the menu, pressing the letter “a” on the keyboard to make the login screen appear, clicking the power icon in the lower right-hand corner, and then clicking “Shut down” from the menu. Windows 8 then shut down. Whew! I thought this might be me, so I searched online for a better way, but it seems others were experiencing the same frustration. Why must this be so hidden? Most of us are coming from operating systems where the shutdown process is self-apparent. Ubuntu, for example, has an obvious shutdown button in the top panel by default. Past versions of Windows have a shutdown option easily accessible from the Start menu. This is what people are already familiar with, so why change what works? At least make the change obvious. Probably the biggest inconvenience I experienced with the new Windows 8 interface is its full-screen, do-one-thing-at-a-time default. For example, when searching for a program, the desktop disappears and the screen fills with the Apps window. Since I usually have a number of projects going on, I like to be able to view what is open on the desktop while choosing a new program to open, so I found this to be an inconvenient nuisance. Other applications operate in the same full-screen style whether they be Photos or Reader to name a few. There are other points to mention about Windows 8, such as the various applications, the improved Task Manager, and the Office look and feel of Windows Explorer, but this is a consumer evaluation version not meant for prime time, so there is little need to delve further. After finally grasping the system known as Windows 8, I found myself relying upon the keyboard (especially the Windows key) more than ever because the easiest tasks, such as opening programs and shutting down the computer, require more effort than what I am using now. Why bother upgrading to this? On the other hand, this is a beta version, so maybe these issues will be resolved. Ubuntu 12.04 feels more like a refinement on Unity and the version 11s. 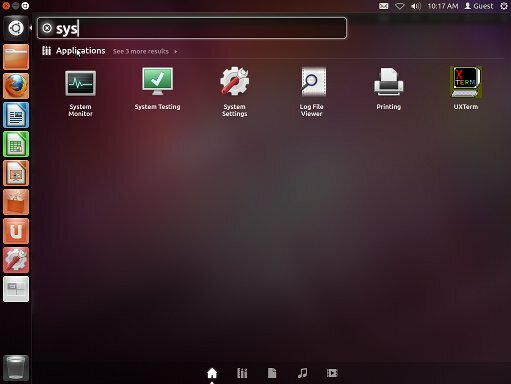 While Ubuntu 12.04 did feel somewhat easier to use than both Ubuntu 11 and Windows 8, and while the updated software and kernel are good to see, Ubuntu 12.04 is still afflicted with the Unity and GNOME 3 GUIs from which there is no easy escape for those who prefer the plain simplicity of GNOME 2. The same gripes I had with Ubuntu 11 and Unity are still present in Ubuntu 12.04. Both Ubuntu 12.04 and Windows 8 suffer from interface over-simplification. This might be fine for new users shy about computers, but for those, like myself, who enjoy tinkering under the hood, it becomes annoying because the interface gets in the way of actually using the computer. It feels like I am playing with plastic toys to build a house instead of using professional power tools. On the other hand, it boils down to what you are already familiar with. Both Unity and Windows 8 require time to learn compared to previous versions. Their GUIs do things differently compared to GNOME 2 and past Windows versions, so whichever you choose, you will need to relearn the steps to achieve the same results. Ubuntu 12.04 is easier to pick up and use than Windows 8. Ubuntu 10.10 was the last great Ubuntu release while Windows XP was the last great Windows release. If using Ubuntu 10.10 or Windows XP, then there is little need to upgrade to any of the newer versions, which, in my opinion, are both inferior. Ubuntu 10.10 and Windows XP do everything I need and do it well without the hassle of “new and improved” GUIs. Now that I have had a chance to get a feel for these new operating systems, my initial excitement has dissipated, and I find myself hoping that Ubuntu 13 and Windows 9 will be improved by returning to their roots. What I am using now runs surprisingly well — and even faster — even if it is older. I like to see improvements and new ideas, but not to the point where they negate usability and obstruct computer usage. Yes, both operating systems tested were beta, pre-release versions subject to change, but if the final releases are going to be like this, then I will stick with my trusty Ubuntu 10.10 and Windows XP. This entry was posted on March 6, 2012, 6:30 PM and is filed under linux. You can follow any responses to this entry through RSS 2.0. You can leave a response, or trackback from your own site. I think that you should include Linux Mint, a Linux distribution which I think you’d prefer to Ubuntu, it uses Gnome 3 with Mint twist and I found it much easier for people used to pre-7 Windows users than Ubuntu whilst having virtually all of the same applications. Linux Mint is superb, and I use it myself. I actually recommend it to others over Ubuntu 11 for the same reasons you gave. There are too many great Linux distributions available to mention, so this article was limited to the beta versions of Ubuntu 12.04 and Windows 8 due to time. Linux Mint deserves notice, so thanks for the input. Nice post! Pretty much exactly what I’m looking at, but it sounds like you know what you’re doing. I just bought a 120GB SSD and don’t want to fork out for Windows 7, so I’m gonna try dual booting Windows 8 with either Ubuntu 12.04 or Ubuntu 10.04. I’ve only tried Ubuntu, and while I like it in theory, in practice I don’t know what I’m doing and I seem to break it more often than I break Windows XP (particularly when updates arrive). But you reckon Mint is the way to go (out of the several OS I’ve mentioned)? From helping out new Linux users and watching their reactions when faced with new Linux systems, Linux Mint 10.10 is the easiest to set up and run out of the box, so I would recommend that over newer Linux Mints and even Ubuntu itself. Think of Linux Mint as an even more user-friendly version of Ubuntu. As good as Ubuntu is, some things require the command line, which scares people new to Linux. Linux Mint attempts to solve this problem by requiring the command line as little as possible (for most tasks), and Mint uses a desktop interface many people are already familiar with. This saves time and helps users get into Linux Mint quicker than Ubuntu or GNOME 2. If you do not mind reinstalling operating systems later on, I would recommend installing Windows as your primary OS for now instead of dual-booting. This way, you can run Linux inside a virtual machine (VirtualBox) until you are comfortable enough with Linux to use it as your primary OS. 1) Most people are coming from a Windows background, so retaining Windows while still allowing Linux on the same desktop allows people to gradually move into Linux. People are able to continue using what they are already familiar with while learning something new. Switching to Linux completely and suddenly is too scary for most people, so this provides a comfortable “safe spot” from which to navigate into uncharted waters. 2) Dual-booting works well, but you must reboot to switch operating systems. A virtual machine provides the same benefits, but you can run both Windows (primary OS) and Linux Mint (virtual) simultaneously without rebooting. This allows you to learn Linux from inside a familiar Windows OS. In addition, the virtual machines can communicate with Windows to transfer files — among many other tricks. 3) Virtual machines support snapshots that restore system states. This means you can explore and tinker with the virtual Linux Mint all you like without damaging your system. If the virtual Linux Mint breaks for whatever reason, just restore the previous snapshot (assuming one is made) and try again. 4) Since you are using a 120GB SSD (Nice! ), a virtual machine will consume less hard drive space than reserving partitions for dual-booting. VirtualBox, for example, supports dynamic hard drive images, which means you can reserve 20GB of hard drive space (stored as a file), but VirtualBox will not actually use all 20GB until needed. If Linux Mint runs on 3GB, it only uses 3GB on the real SSD hard drive and only expands when needed. With dual-booting, you must physically partition 20GB of space whether you fill it up or not. SSD space is precious and expensive, so this might be a slightly better way to conserve hard drive space. 5) Virtual machines let you try out several different Linux distributions at the same time. You are limited only by your physical hardware limitations, so download Ubuntu, Xubuntu, Kubuntu, Linux Mint, Debian, FreeBSD, CentOS, and have fun! Once proficient with Linux, reverse the arrangement. Install your preferred Linux distribution as your primary OS and run Windows inside a virtual machine for those times when you need to use Windows. The purpose for this is stability and security. Linux is quite stable compared to Windows. Also, Ubuntu (and Linux Mint) allows the option to encrypt your home, so each virtual image residing there, including Windows and its normally non-encrypted parts, such as the registry and swap file, are automatically encrypted for better privacy. These are just a few ideas to get started. Your imagination is the limit with an arrangement like this. Of course, your needs will vary, so these are only suggestions. At first, I recommend virtual machines (VirtualBox or VMWare) over dual-booting because they are less hassle to maintain and they will not bring down your entire system if one malfunctions. The only downside is that different Linux distributions perform differently inside a virtual machine compared to running on real hardware. The newer Linux Mint 12 and Ubuntu 11 and up have a few issues with VirtualBox, but any of the older 10 versions (10.04 or 10.10) run surprisingly well, so I would pick one of those to start with. Once comfortable with 10.04 or 10.10, run Ubuntu 11 or 12 to see which you like better (you’ll see why). Since virtual machines do not really exist, so they can be installed and deleted freely without rebooting your computer. This saves the hassle of partitioning and reinstalling, which risks losing important data on the hard drive. Once you have settled on a favorite Linux OS, use that as your dual-boot OS if you choose to configure a dual-boot arrangement. Thanks for the detailed response! I’ll try it out on a virtual box and see how I go.